Why do you have a California Prop 65 Warning Label on your Androvite® product? Androvite® contains ingredients that have small amounts of naturally occurring lead, and the total amount of lead in a full daily serving (in the case of Androvite®, 6 tablets per dayl), even though low, is higher than that allowed by California Proposition 65. The warning is only required for product sold in the State of California. 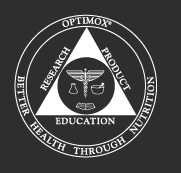 Optimox™ has always tested its products for the presence of heavy metals, including lead, arsenic, mercury, and cadmium. The United States Pharmacopeia mandates no more than 10 μg/lead per day from any product, and all of our products are far below that level. California Proposition 65, however, sets the lead standard 20 times lower, at 0.5 μg/day. Because we have always endeavored to obtain the purest natural ingredients, the vast majority of our products exceed this standard as well. None of our products contain a high amount of lead. Even for Androvite®, which carries the CA Proposition 65 warning, a full daily serving contains a small percentage of the typical daily intake of lead from food (Kehoe; EFSA Journal). In fact, a serving will contain significantly less lead than a serving of many food items in North America (Schroeder and Balassa; FDA Total Diet Study).